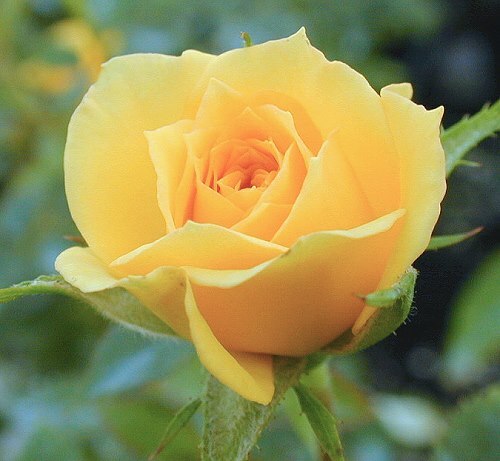 Rise and Shine Miniature Rose was introduced by Ralph Moore in 1977. One of the finest yellow miniature roses available, it can grow to a height of three feet and can get equally as wide. It has a mass of bright yellow flowers summer through fall here in zone 8. Fall also provides a bounty of delicious tiny rose hips that are perfect for making a cup of tea. Rise and Shine Miniature Rose has perfectly shaped buds that are ideal for drying or using in fresh crafts like our fresh Herbal Wreath. It would make an excellent addition to our Crafter's Herb Garden Six Pack.